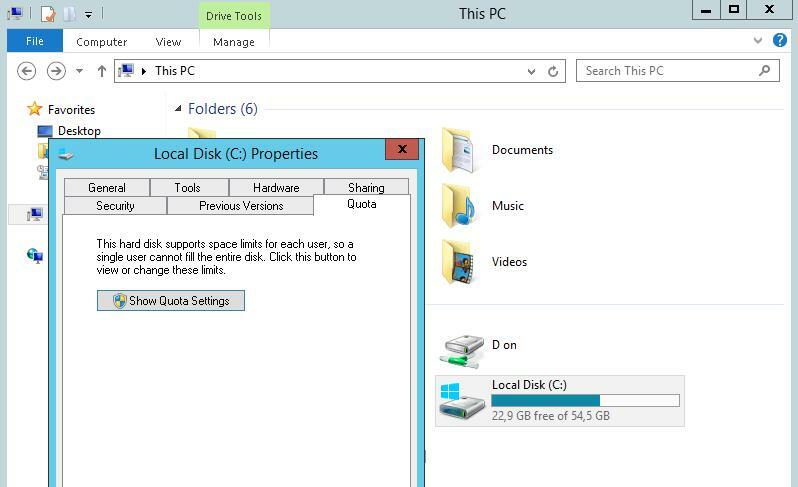 Disk quotas allow Windows administrators to control and manage the size of the disk space used by users on the file systems of servers and workstations. Windows Server supports two types of quotas: File Server Resource Manager quotas and NTFS quotas. Though FSRM quotas are more flexible and convenient, in some cases NTFS quotas can be efficiently used. For example, to restrict the size of roaming profiles directories (but not User Profile Disks) and redirected home folders in RDS scenarios, user directories on an FTP server, personal directories at IIS sites, etc. Using quotas, you can restrict the maximum size of files and folders for each user, so that it doesn’t exceed some limit and stick the entire disk. 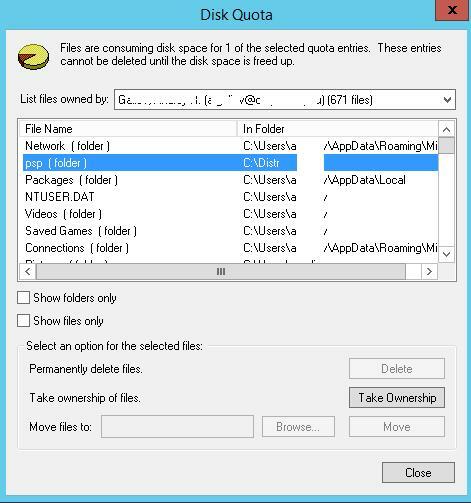 Disk quotas are available both in server and client Windows versions. Let’s consider the case of NTFS quotas configuration on a disk containing user data on the Windows Server 2012 R2. In all previous Windows versions (starting from Windows 2003), the quotas are configured in the same way. To enable the quota policy for this volume, check Enable quota management. It is not recommended to enable Deny disk space to users exceeding quota limit at once. It is preferable to estimate the current utilization of disk space by your users. In our example, we want to limit the users to 300 MB on the server disk. Save the changes (Apply). In some time (depending on the disk size and the number of files), Windows will count the total usage of the disk space by every user. After clicking Quota Entries, you can go to the resulting table showing quotas and the current size of the space used by every user (whose files are found on file system). From this window, you can create/change/delete the quota value. Thus, you can override standard quota settings, for example, by increasing the quota for a certain user. To disable NTFS quotas for a specific account, open the properties (Properties) of the account in the quota table and check Do not limit disk usage. Important. 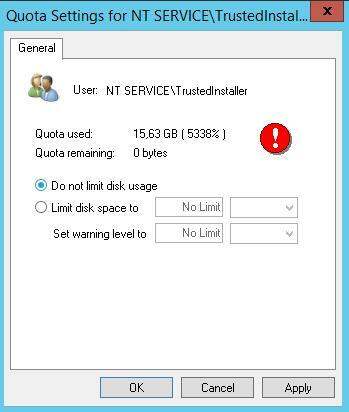 You must disable quotas for the system accounts NT Service\TrustedInstaller and NT AUTHORITY\SYSTEM, otherwise the system won’t work. If you want to get the list of files belonging to a specific user, who has exceeded the quota limit, click Delete. 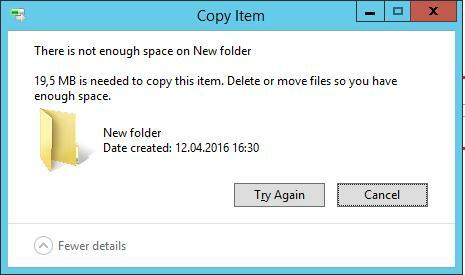 This dialog box allows to change the owner of a specific file (Take ownership), delete (Delete) or move (Move) it. 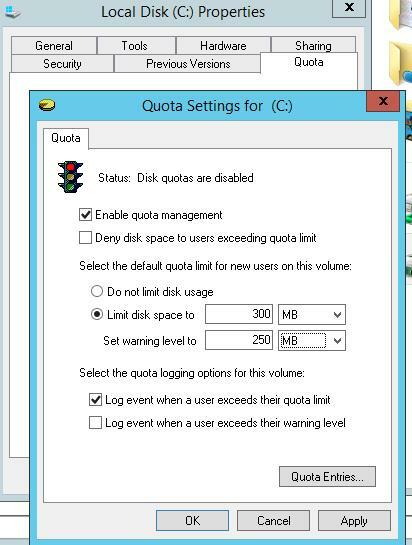 After you have arranged your quotas in the audit mode, you can enable Deny disk space to users exceeding quota limit. After that the user can’t exceed the allocated space on the disk, and the size of the disk in the user session will be displayed according on its existing quotas. In this example for my account on the C: \ drive used 70 MB of the 300 MB quota. A user hit their quota limit on volume C:. 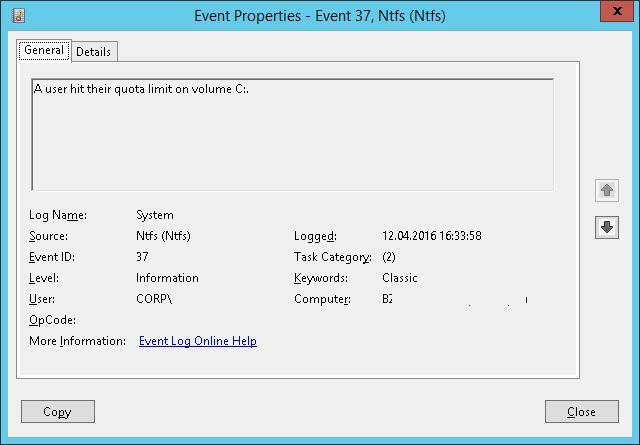 NTFS quotas can also be managed from the command prompt. To do it, the command fsutil quota is used.